It’s a Friday and for us Friday nights are sometimes Family Movie Nights. It’s the end of the week and it’s often a wind-down night as well. We look forward to it. 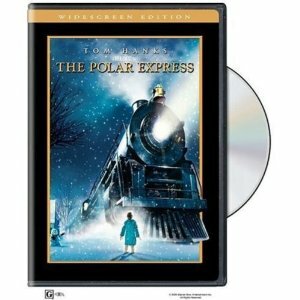 In the winter, our Family Movie Night movie is usually “The Polar Express” at least once. I got this book in 1993, before there even *was* a movie! We have the hardcover version of the Chris VanAllsburg book, and it’s even autographed. We also have the special bell from the story as well as the cd of the story from a gift set that we received a few years back. You can find the book and the movie here on Amazon.com. There are several bell crafts you could do to go along with “The Polar Express” if you’d like. Cups, pipe cleaners, stickers and glitter make for an easy jingle bell craft. If you have a real jingle bell, you can put it inside so that the bell actually rings. 2) Turn a styrofoam drinking cup upside down, put a pipe cleaner through the top (gold works well) turning it into a bell that way, decorating it on the outside any way you’d like. During the winter months, Family Movie Night often includes a special treat: Homemade Hot Chocolate. My kids LOVE this recipe and it came from a cookbook I received as a gift from one of my Stampin’ Up! customers several years back. The cookbook is called “Old Fashioned Holiday Recipes.” It was full of many great recipe ideas, but this one has always been a favorite find and perfect for our Family Movie Nights. It would go especially well with the “Krispie” Chocolate Chip Cookies recipe from yesterday! Hot off the stove tonight! In a large saucepan over medium heat combine Eagle Brand, cocoa, vanilla and salt; mix well. Slowly stir in water. Heat through, stirring occasionally. Do not boil. Store covered in refrigerator. Makes about 2 quarts. Hot chocolate can be stored in the refrigerator for up to five days. Mix well and reheat before serving.